Have you ever wondered how much reach you (or your business) has on Twitter? One way to find out is by using Twitter's free analytics tool. It will tell you which of your tweets have received the most interaction from your followers. 1. Sign into your account by going to http://analytics.twitter.com. 2. You will be taken to the campaigns page, which requires money for Twitter ads. Instead, go to the top of the page and click Analytics. 3. Click on Timeline Activity. At the top of the page, you'll be shown your timeline activity for the last month, including mentions, follows, and unfollows. Follows (people who have followed your Twitter account) are the blue lines above the x axis. Unfollows (people who have unfollowed your account) are the pink lines below the x axis. In the gray area underneath the chart (see picture below), you will notice that the display of tweets defaults to ALL. If a tweet has been clicked on, you'll see text that tells you how many clicks the tweet received. To the right of this, is the number of favorites, re-tweets, and replies to each tweet. 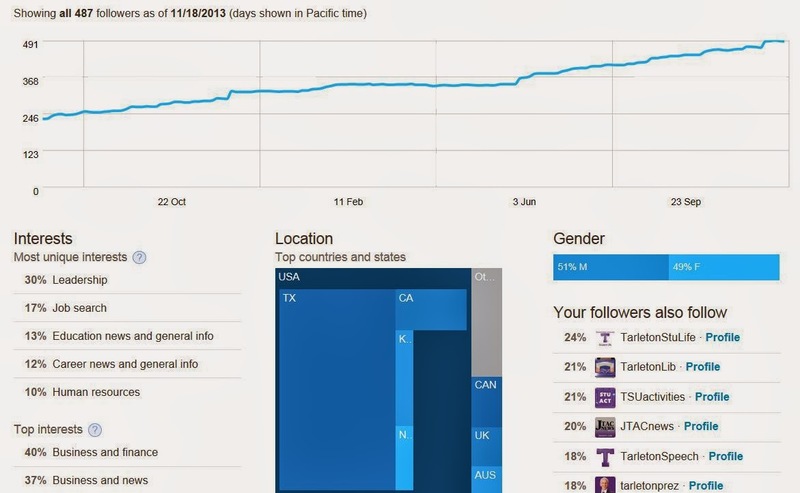 Screenshot of TSMRI's Twitter analytics. 4. To find out which of your tweets have been the most successful, click on BEST instead of ALL. This will show you the number of tweets that have been favorited, replied to and re-tweeted the most. This is the type of content you want to duplicate on your Twitter feed, so take note. 5. Learn more about your followers. To get this information, click on Followers instead of Timeline Activity (step 3 above). You will be taken to a page like the one below. Screenshot of TSMRI Twitter Analytics information. Some of the information included is how many followers you've gained over the past year, what their interests are, where they are located, their gender distribution, and what Twitter accounts they follow. Sometimes the data will yield up surprises. For example, you might guess that most of our followers would be interested in social media, but their number one interest is actually business and finance. Use information about your followers to tailor your tweets to their needs. Note: Twitter will require you to walk through the first few steps of setting up an ad campaign before you can access Analytics. Click on "Get Started" and on one of the campaign buttons. Since you have not given financial information out, you will not be charged. Keep following steps until you see the word "Analytics" at the top of your screen. Questions about Twitter? Tweet us at @tsmri and we'll be happy to help.